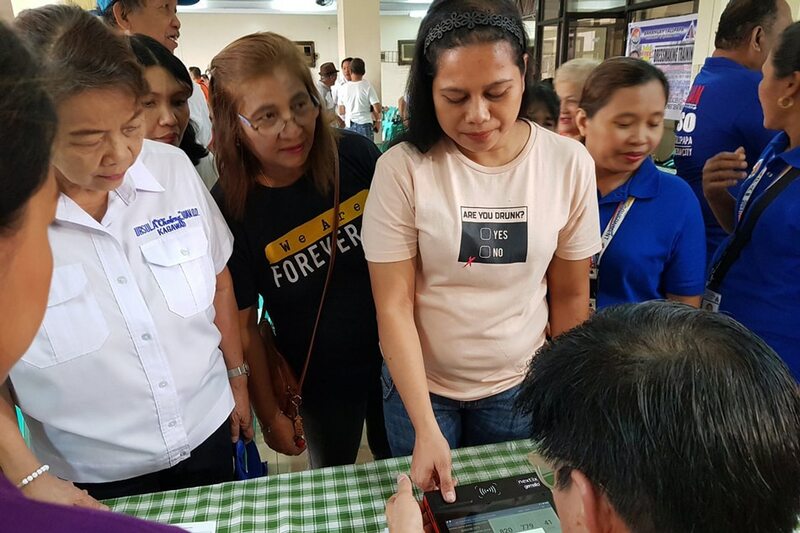 MANILA - The Commission on Elections (Comelec) on Tuesday field-tested finger scan devices that can more easily identify so-called “flying voters” in the May midterm elections. The devices called Voter Registration Verification Machines (VRVM) identify which voters are listed in specific polling precincts by examining their fingerprints. “This will address the issues about ‘flying voters’ or voters who are attempting to vote using the name of another person,” said Jovencio Balanquit, assistant regional election director for Metro Manila. Before rolling out the machines in pilot areas on election day, the Comelec tested some units, roughly the size of a thick computer tablet, in Manila and Quezon City. In Barangay Talipapa, Quezon City, some voters had to repeatedly press their fingers on the machine before it verified their registration. In cases where no information appeared on the screen at all, election officials validated voters’ information from a printed list or by manually entering their names in the machines — the same process that will be followed on May 13. “'Pag talagang wala siya doon (If he is not there), that only means na he is not a registered voter,” Balanquit told reporters. Overall, the finger scan in the Quezon City field test worked and took less than a minute to verify voters’ information.